Annual CO2 emissions for an average U.S. household (blue = direct; green = indirect). Reference: Jones & Kammen 2011. For those of us concerned about climate change and other global issues, the challenges can feel overwhelming. Despite solid scientific consensus that our world is warming from fossil fuels and deforestation, there’s been a lot of talk but very little action to foster sustainable solutions and let cooler heads prevail. The sickly state of the global economy has led many to assume we can’t afford to do anything anyway. But the good news is we don’t need to wait for politicians and corporations to clean up their acts. We can do it ourselves. 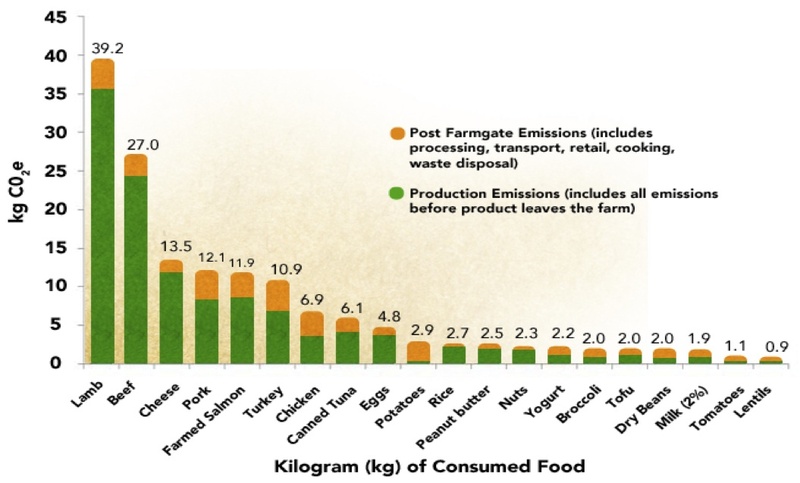 The power plants, factory farms, timber mills, and industrial smokestacks are all ultimately producing things that we use. While the Oroeco crew aspires to live by the original Golden Rule, there’s also wisdom in its cynical parody: “(s)he who has the gold makes the rules.” It’s your gold that companies are trying to get, so we think you should also be the one making the rules. The power to change things is ultimately in your hands, and your wallet. It’s both a daunting and an empowering revelation. Which decisions matter most? Well, the answer depends on where you live, what your lifestyle is like, and what you care about. A great place to start (at least as far as climate is concerned) is a study by Chris Jones and Dan Kammen from the CoolClimate Network (a research team based out of University of California, Berkeley). The graph above shows how greenhouse gas (GHG) emissions (measured in annual metric tons of carbon dioxide equivalent, mtCO2e) look for an average US household. 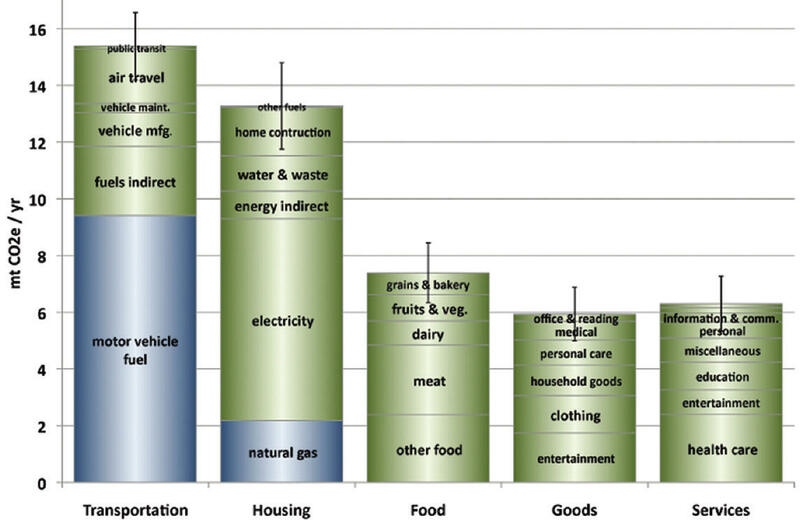 While transportation and housing represent the largest categories of emissions, it may be surprising that food and other goods and services also have substantial GHG footprints. What makes the CoolClimate study particularly appealing is that it not only shows where there’s room for improvement, it also illustrates (in the graph below) how saving carbon can end up saving you a lot of money. Some savings can come simply from buying less stuff. Additional savings comes from investing in more efficient products, like energy efficient appliances and a low-carbon diet (e.g. more veggies, less meat). Curious where the most carbon and cash can be saved in your life? Take the CoolClimate carbon calculator out for a spin to get a personalized ranking of the actions which maximize your savings based on your lifestyle. 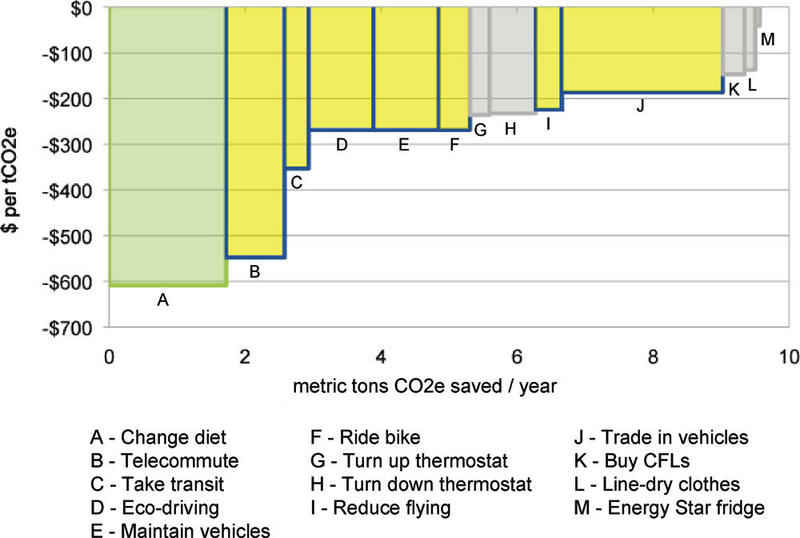 Average $s saved from CO2 reducing actions (green = diet; yellow = transport; gray = home). Reference: Jones & Kammen 2011.